Christian Biblical scholar; born at Göttingen Nov. 16, 1803; died there May 4, 1875; educated at the University of Göttingen, where he studied philology and especially Oriental languages. He became private tutor in 1824 and professor at Göttingen in 1827. Being one of the "Göttingen Seven," who in Nov., 1837, protested against the violation of the constitution by the king, Ernst August, he was removed from office. He was called to T¨bingen in 1838, and returned to Göttingen in 1848, and remained there till 1867. 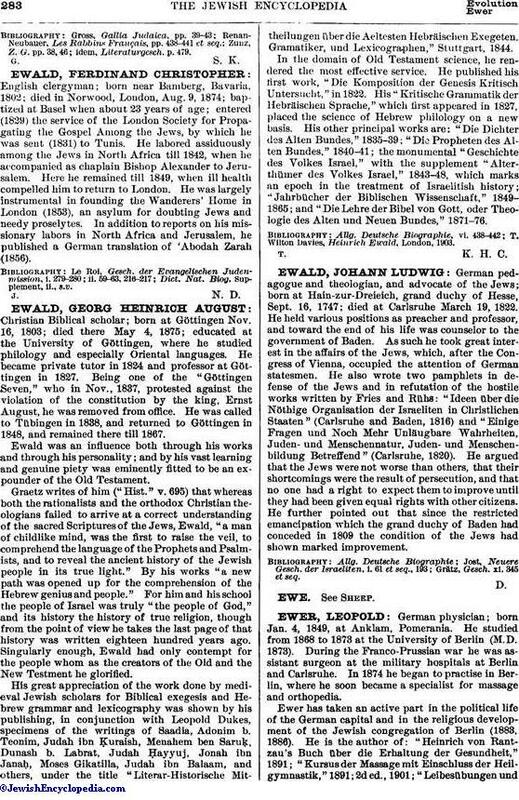 Ewald was an influence both through his works and through his personality; and by his vast learning and genuine piety was eminently fitted to be an expounder of the Old Testament. Graetz writes of him ("Hist." v. 695) that whereas both the rationalists and the orthodox Christian theologians failed to arrive at a correct understanding of the sacred Scriptures of the Jews, Ewald, "a man of childlike mind, was the first to raise the veil, to comprehend the language of the Prophets and Psalmists, and to reveal the ancient history of the Jewish people in its true light." By his works "a new path was opened up for the comprehension of the Hebrew genius and people." For him and his school the people of Israel was truly "the people of God," and its history the history of true religion, though from the point of view he takes the last page of that history was written eighteen hundred years ago. Singularly enough, Ewald had only contempt for the people whom as the creators of the Old and the New Testment he glorified. His great appreciation of the work done by medieval Jewish scholars for Biblical exegesis and Hebrew grammar and lexicography was shown by his publishing, in conjunction with Leopold Dukes, specimens of the writings of Saadia, Adonim b. Teonim, Judah ibn Ḳuraish, Menahem ben Saruḳ, Dunash b. Labrat, Judah Hayyuj, Jonah ibn Janaḥ, Moses Gikatilla, Judah ibn Balaam, and others, under the title "Literar-Historische Mittheilungen über die Aeltesten Hebräischen Exegeten, Gramatiker, und Lexicographen," Stuttgart, 1844. In the domain of Old Testament science, he rendered the most effective service. He published his first work, "Die Komposition der Genesis Kritisch Untersucht," in 1822. His "Kritische Grammatik der Hebräischen Sprache," which first appeared in 1827, placed the science of Hebrew philology on a new basis. His other principal works are: "Die Dichter des Alten Bundes," 1835-39; "Die Propheten des Alten Bundes," 1840-41; the monumental "Geschichte des Volkes Israel," with the supplement "Alterthümer des Volkes Israel," 1843-48, which marks an epoch in the treatment of Israelitish history; "Jahrbücher der Biblischen Wissenschaft," 1849-1865; and "Die Lehre der Bibel von Gott, oder Theologie des Alten und Neuen Bundes," 1871-76. T. Wilton Davies, Heinrich Ewald, London, 1903.